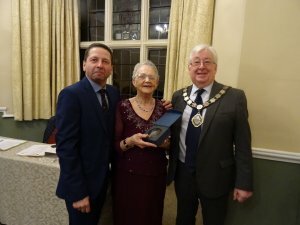 The annual Mayor's Awards Ceremony for Services to the Community took place at Rushden Hall on the evening of 19th March 2019. The worthy recipient was Mrs Jean Anderson. The Mayor, Cllr David Coleman, presented Mrs Anderson with her award. Jean has lived at Imperial Court with her husband John, for the last 8 years. Jean is the unofficial volunteer fund raiser and over the years she has gone out to the local community to find ideas and meet people, to try and raise funds for residents activities at Imperial Court. At the end of last year she contacted local retailers asking for donations for the Imperial Court Christmas raffle. She managed to acquire so many prizes that there was no need to purchase any more out of the activity funds! Well done on all your efforts over the years Jean! The Mayor of Rushden would like to invite you to his Celebration of Christmas evening, on Friday 14th December, at the Heritage Church, Park Road, Rushden, with performances from Southend Junior School Choir and 'It's My Life Group'. The evening will commence at 7.00pm. 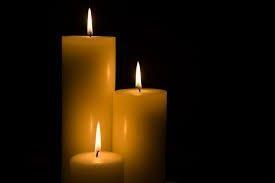 Following the service light refreshments will be served in the Church Hall. 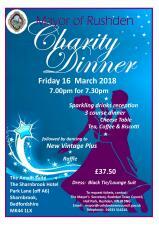 It promises to be an enjoyable evening and the Mayor looks forward to welcoming you. 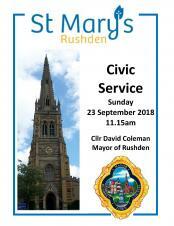 The Civic Service of the Mayor of Rushden, Cllr David Coleman, will take place at St Mary's Church, Rushden at 11.15am. Please kindly be seated by 11.05am. 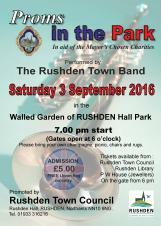 Following the Service light refreshments will be served at Rushden Hall in Hall Park. Come and join all the fun of the fair in Rushden. 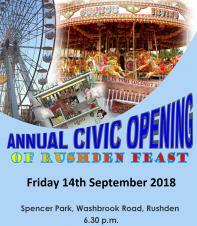 The Mayor of Rushden will officially open the Rushden Feast on Friday 14th September 2018. Assembling at the Dodgem cars for 6.30pm, a short service will be conducted by Rev Ben Lewis, before the fair is officially opened. The winner of Bark in the Park 2018. The weather couldn't have been better on Sunday for the Annual Bark in the Park event! The total amount raised on the day was £2200 which will be divided between Labradors in Need, Spaniel Aid, Medical Detection Dogs, Bassett Rescue and Dog Watch. Thank you to all those who came and supported this great event. 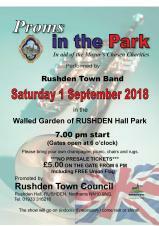 The 'Proms' season is upon us, and we in Rushden pride ourselves on a very popular evening's entertainment with our very own 'Proms in the Park', in aid of the Mayor's Chosen Charities. 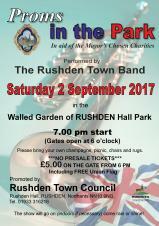 Set in the Walled Garden in the beautiful grounds of the Hall Park, the music will be provided by The Rushden Town Band, playing all the favourites such as Land of Hope and Glory, Rule Britannia and Jerusalem accompanied by local singers. As this is an outdoor event please be suitably dressed to keep warm. Rushden Town Council is seeking nominations for the Mayor's Awards for Services to the Community for the year 2017 - 2018. The Mayor's Award is given to an individual for their work and commitment within the community of Rushden over a number of years. (Group nominations will not be eligible for an award). 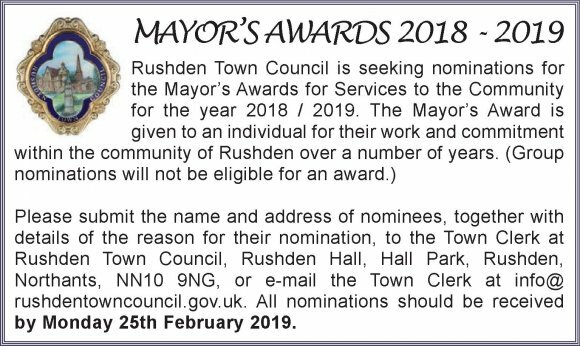 Please submit the name and address of nominees, together with details of the reason for their nomination, to the Town Clerk at Rushden Town Council, Rushden Hall, Hall Park, Rushden, NN10 9NG, or e-mail the Town Clerk at info@rushdentowncouncil.gov.uk. All nominations should be received by Friday 23rd February 2018. **Update** At a special Awards Ceremony at the Town Hall, on Tuesday 20th March 2018, the Mayor of Rushden, Cllr Barbara Jenney, has honoured four people for their work to make a difference in the community. The nominees for this year's Rushden Mayor's Awards were Joanne Vissian, Paul Clarke, Janine Musson and Maureen Ellis. "Jo is very much at home at Party in the Park with a black bag and picker in her hand and keeps the litter down in the park throughout the day. Her willingness too to help at the Christmas event does not go un-noticed. We always know we can count on Jo if we need extra hands. In fact Jo is a great asset to the Events Working Party and I feel an award to thank her for all the hours she has given to the community would be a fitting reward to a much deserved recipient." Paul Clarke of Higham Ferrers was put forward for the award by PO John Blackadder from the Rushden Sea Cadet Corps. He said: "Paul previously serving in the Royal Navy and is a veteran of the Pingat Jasa Campaign, a dedicated volunteer passionate about supporting veterans and a mainstay at T.S. Diamond, Rushden, branch of the Sea Cadet Corps. 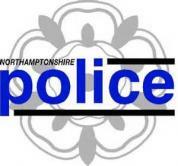 As well as his service in the Royal Navy, Paul has served as a detective sergeant with Northamptonshire Police. He was also a founder member of the Rushden branch of the Maritime Volunteer Service and when not working as a Chief Petty Officer at T.S. Diamond, he teaches disabled and disadvantaged people how to sail on Grafham Water." "In the Sea Cadets as an experienced adult volunteer, Paul's organisational skills and willingness to lead by example, establish standards and motivate his group maximise attendance at drill nights and ceremonial events. He is the longest serving member of the unit, and has helped it overcome many challenges. I believe it is fair to say that without Paul's commitment the unit would have closed. Currently, as well as being the coxswain on board T.S. Diamond, he works in a caretaker/maintenance capacity, and can be found most days at the drill hall, either maintaining uniform kit and equipment or helping contractors. Paul is also heavily involved with The Heritage Chapel which he supports." Michelle Ellis spoke up for Janine Musson. She said in her nomination "Janine moved to Rushden in 2002 following retirement from work, knowing no-one but family. Janine committed to building a social network through volunteering at a number of organisations in Rushden. On a Tuesday morning Janine volunteered at the Mission Church serving refreshments to the local community. Regrettably Janine has just withdrawn from this service but very much enjoyed her time there. Tuesday evenings sees Janine singing with the St Cecilia Singers, performing at several concerts throughout the year for the local community. On a Wednesday morning Janine volunteers at Rushden Park Care Home. Janine organises the church service which takes place in the home every week, booking the vicars, printing the hymns and playing the organ. Janine arrives early to assist the staff in bringing the residents from their rooms and helping to return them after. Many years ago, conscious that many residents had limited contact with young people, Janine often took her grandchildren along to sing-a-long and share a biscuit." 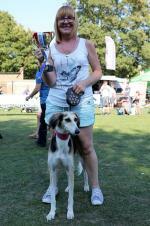 "Janine has also taken on the duty of treasurer and helps out at the summer fete. She also volunteers at the Heritage Chapel where she has a number of duties. Janine plays the organ at Sunday services, is on a rota for cleaning the church and flower arranging, helps with bookings including opening and locking up afterwards and assists at events. She has had a huge involvement with gymnastics for many years and is currently the welfare officer for Eclipse Gymnastics." "Janine is responsible for safeguarding and promoting the welfare for young people within the club. While this does not take place within Rushden, Janine also runs a gymnastics club back where she used to live in Flitwick, Bedfordshire. Janine coaches voluntarily three nights a week travelling for about an hour each way to attend the sessions. Janine is also east regional chairman for acrobatic gymnastics, Bedfordshire County Gymnastics chairwoman and organises all acrobatic competitions covering the east region." 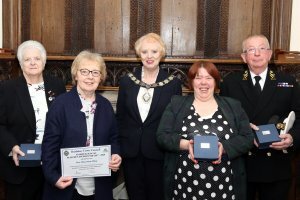 Maureen Ellis was also nominated but, as she already has a Mayor's Award from 2012, was invited along to the presentation to receive a certificate for her continued voluntary work and commitment in the community over the past five years. 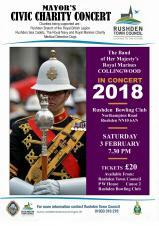 Tickets are now available for the Mayor's Civic Charity Concert by the Band of Her Majesty's Royal Marines Collingwood. Proceeds in aid of the Rushden Branch of the Royal British Legion, Rushden Sea Cadets, The Royal Navy & Royal Marines Charity and Medical Detection Dogs. 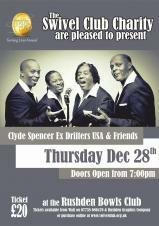 The Swivel Club are pleased and proud to invite Ex American Drifter Clyde Spencer performing with him some well-known singers from the Motown scene. This classic Motown night shall be one of the best performances Rushden has seen, dancing the night away with some of the best loved Drifters and Motown songs. This event is being promoted by the Swivel Club, who are themselves a locally based Charity, which raises funds for a number of good causes. On this occasion the Swivel Club are kindly supporting the charities nominated by the Mayors of Rushden and Higham Ferrers. 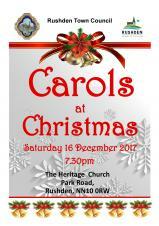 The Mayor would like to invite you and your friends to join her Carols at Christmas on Saturday 16th December. Following the service you are invited to stay for wine mince pies in the Church Hall. 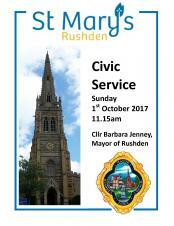 The Civic Service of the Mayor of Rushden, Cllr Mrs Barbara Jenney, will take place at St Mary's Church, Rushden at 11.15am. The Overall Winner from Sunday's Bark in the Park 2017. See the Gallery on the Community Page and www.malcolmswindenphotography.instaproofs.com/gallery for more pictures. An update on Sunday's event: listed below are all who generously contributed either time, money or goods, to enable us to run a fantastic Bark in the Park 2017! Destination Pet, Higham Ferrers, for their overall sponsorship of the show and for supplying all the prizes for the classes and giving us great support throughout the day, including judging. 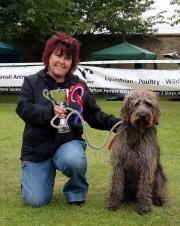 Rushden Vets for their wonderful support and professional input, including judging. A special thanks to Simon Hill and Barb for their informative and entertaining demonstration. DogWhys have-a-go agility - Rachel and Ann who clocked up so many miles assisting dogs and owners with their agility attempts. The Charities who attended: Pets as Therapy, Labradors in Need, Spaniel Aid UK, Northamptonshire Dog Watch, Dogs Trust and Medical Detective Dogs. The Stallholders: Scruffies Dog Grooming, Country Companions Pet Services, Sylvade, Wildlife & Pet Portrait Artist , The Dog House and Rummage Rugs/Forever Aloe. For the sponsors of the classes: Nelly's Kitchen, Angie's Ices, JH May Electrical, Pizza Venezia, Absolute Accounts, Camper Cones, A E Cook, King Tools, J.W. Clark Groundworks, Brett Jarvis Plastering and PAD Builders. To our judges: Vivienne Prodger, Paul Wilcox, Richard Lewis, David Coleman, Colin and Linda Wright, Barbara Surridge, Rachel Bracewell, Medical Detection Dogs, Phil Blanchard, Barbara Jenney, Sarah Peacock, Rachel Roberts, Richard Prodger and Rachel Wilcox. To Wendy, Maureen, Olwen and Janet for serving up top class Pimms and looking after the raffle. To Mike and Shelby for manning the Lucky Dip. Barb for her witty and informative commentary. Thea for her tireless efforts in securing prizes and also for coming up with the Ark in the Park idea! House of Venom for scaring everyone to death! Amazing how many people have now touched a snake! And finally...to all the hardworking staff from Rushden Town Council. A popular evening's entertainment with our very own 'Proms in the Park'. Set in the Walled Garden in the beautiful grounds of the Hall Park, with music provided by The Rushden Town Band playing all the favourites such as Land of Hope and Glory, Rule Britannia and Jerusalem. Bring your own champagne, picnic, chairs and rugs. The show will go on (indoors if necessary) come rain or shine! All proceeds from the event will go towards the Mayor's chosen Charities. 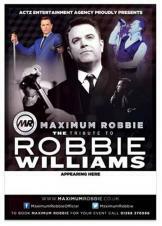 Headlining the evening Maximum Robbie is without doubt one of the best Tribute acts performing on the European circuit today. Where Scott Borley (Robbie) is concerned energy and enthusiasm are undoubtedly the key. He has exploded onto the UK Tribute scene in a way truly reminiscent of the man himself. His energy and commitment levels are boundless and his resemblance to the real Robbie is striking to say the least. Let him totally entertain you with the vast array of hits including many of the Take That favourites and swing sets included, as well as some less conventional personal favourites from Scott's own personal archive. 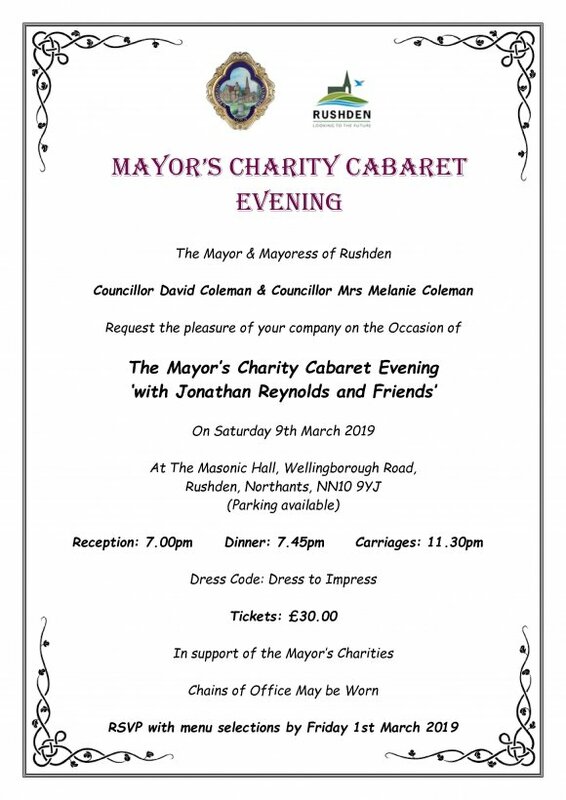 Tickets are priced at £35.00, which includes a three course dinner, and are available by downloading the Ticket Request Form below and returning to Mrs Jemma Butler, Mayor's Secretary, Rushden Town Council, Rushden Hall, Rushden, Northants, NN10 9NG by Friday 10th February 2017. 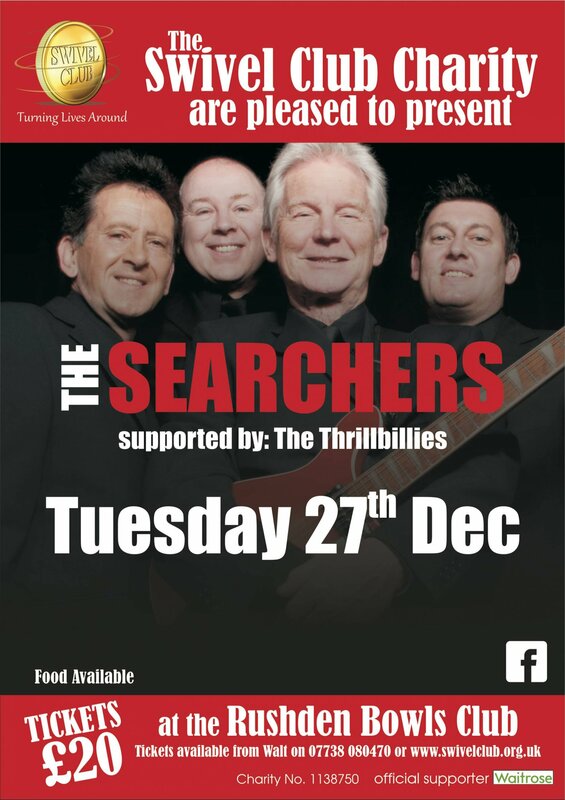 Supporting the Mayors' of Rushden Town Council and Higham Ferrers Town Council, the Swivel Club would like to invite you and your friends to 'The Searchers in Concert' on Tuesday 27th December 2016. This event is being promoted by the Swivel Club, who are themselves a locally based Charity, which raises funds for a number of good causes. On this occasion the Swivel Club are kindly supporting the charities nominated by the Mayors' of Rushden and Higham Ferrers. 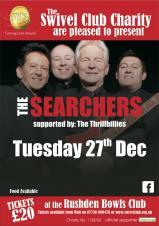 The Searchers are one of the few British pop groups who have maintained their position at the top for well over 45 years. Second only to the Beatles as Liverpool's finest 60's group. Food can be purchased on the evening and a licensed bar will also be available. The Mayor of Rushden would like to invite you and your friends along to her family Carol Service. The evening is aimed to be a 'family friendly' service rather than a more traditional service, encouraging as many families and their children to come as possible. 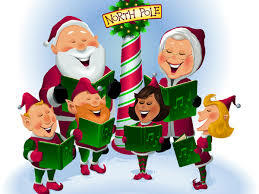 Southend Junior School Choir will be singing all of your favorite carols. Setting the trend, the wearing of a Christmas themed jumper is a must!!! Following the service you are invited to stay for tea, coffee and mince pies in the Church Hall. The Civic Service of the Mayor of Rushden, Cllr Tracey Smith, will take place at St Mary's Church, Rushden at 11.15am. 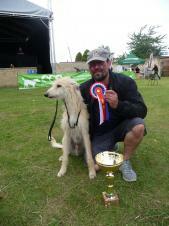 Rushden Town Council's third annual Dog Show has once again proven to be a huge success. The Show was generously sponsored by Destination Pets of Higham Ferrers and we would like to thank them for the prizes they gave for all the winners in all the classes. We would like to thank all our local sponsors who sponsored individual classes. We had over 430 entries in the various classes and we managed to raise £1,400 for both the local animal charities who attended and the Mayor's charities. Special thanks to Cesare Marinaro for once again producing our marvellous dog friendly pizza for the "Fastest Sausage Pizza eating" contest. We would also like to thank Canine Coaching for their continued support for this event and all the Council staff, Councillors and volunteers who helped on the day. Tickets are priced at £5.00 and are available from Rushden Town Council, Rushden Library or P W House (Jewellers).